Thank you God! It stopped raining, the sun is shining and it's warmer than 50 degrees today! I think we might hit the 65 mark today! Could it be? Could it finally be the beginning of Spring! Now if only my pile of ever growing work would disappear so I could leave early and enjoy the sun-then it would be a perfect day. Since I don't see my pile of working going anywhere I took the opportunity to walk around campus during lunch time and enjoy the sun and warmth. As I walked around I saw girls in sandals in very neutral colors: brown, black, tan, gray, but no color! I don't know about you but I love the days when I can wear easy breezy neutral colored sun dresses and bright colored sandals. 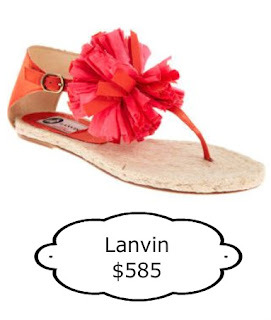 So after lunch I went on the search for a pair of bright colored sandals and came across the Lanvin Pom Pom Espadrille sandals from Barneys in the most gorgeous pinky orange color. I adore them but hate the price tag, so I then went on the hunt for similar sandals with lower price tags. I love this pink color! Maybe it's just me but I love to wear color, especially when the grass is still so dull. I feel like I'm helping cheer up the grass so it will turn green again.These are the contenders I found! Tell me- Which one do you like the best? I'm sort of crushing on the Gap version- especially since they are super cheap and they come in four other colors! Hope you all enjoy this beautiful day! PS- A giveaway will be coming up soon! Follow me on Twitter or Bloglovin to be the first to know!